His motto, to make you see life coloured ORANGE! The colour of mad euphoria! Jimmy Delp considers himself a magician ! But every time he tries to perform it’s a catastrophe!!! In order to entertain us he finds himself in the craziest situations, from levitating, turning into a skeleton or losing his own arms. The quick-fire change of scenes and the impeccable timing of the effects reminds us of a Tex Avery cartoon, with guaranteed success and laughs. It’s an extremely visual show: grand illusions, levitation, transformations, dividing the body in two, contortion… choux de Bruxelles! A new and original illusion that you won’t be able to ignore. As a human wheel he leaves the audience completely gobsmacked by what happens. Swept up in a whirlwind at fever pitch the audience find themselves in incredible situations. He travels to Tahiti, finds himself in the arms of a pin-up model and ends up being transformed into a hen! The audience is reduced to fits of laughter. A production full of crazy twists and turns with an unexpected finale, in the masterful control of Jimmy Delp who remains true to form. An original sketch which always gets a very successful reception. 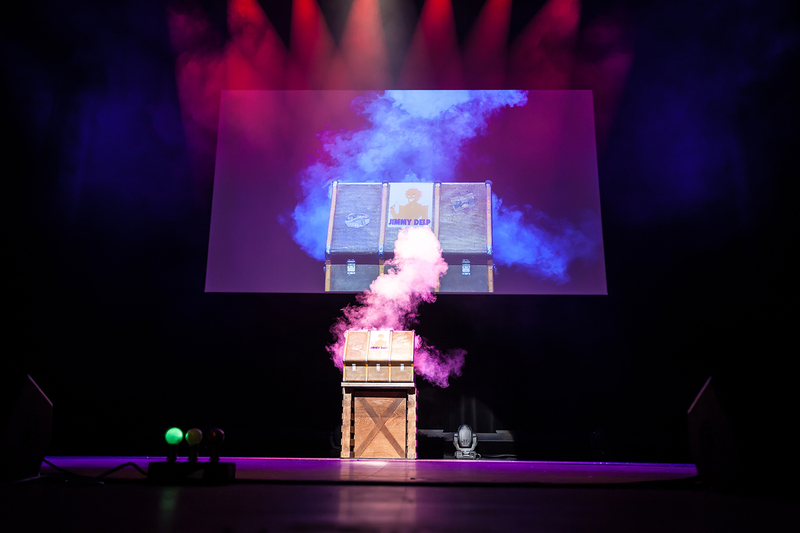 An audience-member is invited onstage and becomes a magician for the evening. Dressed in costume and hat, he is able to do magic tricks with amazing competence under the supervision of Jimmy Delp’s hands. The illusion is so convincing that the audience believes the magic is coming entirely from the person invited on stage. With a pace that rises to a crescendo, the situation becomes crazily out of control. Laughter guaranteed. Discover Jimmy Delp’s Stand UP show too !